Genealogy humor: “Only a Genealogist regards a step backwards as progress”. While amusing, it also points to an interesting issue faced by many people interested in genealogy. Many people who research their family are very focused on going back as far as they can. Perhaps the thought is that if you go back far enough you’re bound to find someone famous (or infamous) you’re related to, some royal blood, family that lived in a famous town, or lived through famous events in history. There are actually a few different directions you can research your family. You can, as mentioned, research up your tree. You can also research down your tree, taking your oldest known ancestor in one line and researching all of their children, grandchildren, etc. (not just the line that leads to you). 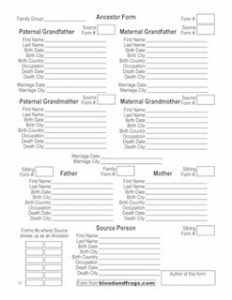 You can also research sideways, researching collateral ancestors, like the siblings and spouses of your known ancestors. Each of these techniques is useful, and indeed you will likely need to try all of them when doing your research if you want to be successful. Let me give a good example of why researching your non-direct lines is important. Let’s say you’ve tracked back to your great-grandfather who lived in Poland or Russia in the 19th century before moving to the United States in the early part of the 20th century. That fits the profile of a large percentage of American Jews. Now if you’ve been able to find out about the great-grandfather but haven’t been able to get back further than that, we call that a brick-wall. 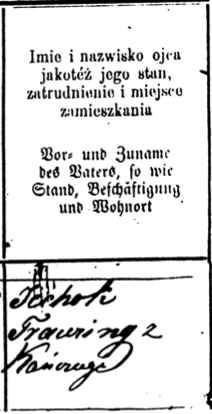 Maybe you only have information on your great-grandfather from after he arrived in the US, and you haven’t been able to find the name of the town where he was born in Poland. Maybe you know which town he was from, but it’s a large city and he has a common last name, which makes research nearly impossible. In this case you’ve researched up your tree to your great-grandfather. The next step is to research down your tree from your great-grandfather to find all of his descendants, your aunts, uncles, cousins, etc. Even if your goal wasn’t to document these branches of your family, you need to realize that just like you have certain information on your family and where they came from, your extended family likely has different information, some small piece which might help you in your search. Mapping out all of the descendants of your most-distant-known-ancestor can frequently lead you to additional information about that ancestor. In my own family research I was looking for records in the wrong town for many years because that’s where my grandfather said our family was from originally. It was partially true. His siblings had been born in that town, as had some of his father’s siblings. It was, in fact, one of his father’s siblings’ records which led me to the town my gg-grandfather was from originally. If I had only been searching directly up my tree, I would never have discovered this fact, since my great-grandfather’s birth record (which took much longer to find in any case) did not name the town where his father was born. Even though it might seem a waste to look for records on all the siblings of the people whom you are primarily searching for (you can think of this as searching sideways), remember that they share the same parents and grandparents, and thus any information you find will help your search. An important point is that it turns out that cousins of mine knew the town my gg-grandfather was born in long before I discovered it. Had I been in touch with these distant cousins earlier, it would have saved me a lot of pointless research. Another way to search sideways is to contact cousins that you may not have figured out quite where they fit in your tree. In the case above, it was actually a cousin whom I knew was related, but wasn’t sure how they were related. If I had in fact pursued the question of how we were related and asked where their branch was from, it would have led me straight to the town from which my branch also originated. Also, if you find references to relatives in family letters and don’t think it’s worth figuring out who those distant relatives mentioned are, think again. If you’ve hit a brick wall, those distant cousins, or their descendants, may be the ones that can help you knock down that wall. Those distant relatives may also have photographs of your common ancestors. Another example from my own family concerns family photographs. I received portrait photographs of ancestors of mine, but without labels showing me who they were. After contacting a distant cousin and having him send me family photographs in his possession for me to copy, I found other copies of the same portraits with the names labeled on the back. They were, in fact, my ggg-grandparents, the in-laws of the gg-grandfather mentioned above. Many years later, someone contacted me through the JewishGen Family Finder (read my earlier article on JGFF if you’re not familiar with this amazing resource for Jewish researchers) and he turned out to be a 4th cousin of mine, descended from the same ggg-grandparents. Now, because I had received the portraits, and another cousin had labeled alternate versions of the same pictures, and this cousin from the other side of my family (he was a descendant of the sister of my gg-grandmother) had found me through JGFF, he now had photographs of his ggg-grandparents. This is why it’s so important to seek out your distant cousins, because you never know who has what information (or what photo). So when searching for your relatives, even your direct ancestors, always remember to look for other descendants, some of which may know much more (sometimes just that one tiny important detail more) about your ancestors than you. Feel free to share your stories on finding information from distant cousins in the comments. Philip, you are always worth reading; but especially so (for me) when you encourage me in habits that apply to anyone of any ethnic group as this one does. In so far as I’ve been able (and I’m pretty much a raw beginner after 3-1/2 years of searching) I have always chased the collateral relatives. Neighbors are interesting also because they often moved together (from Europe to the US or from one state to another). Just this weekend I was contacted by the wife of a 3rd cousin once removed because she found my posts on a public tree. Now I not only have 1 1/2 pages of new information on this family (my father’s first cousin and his decendents); I also now about some family information in museums I didn’t even know existed! You are so correct! Pay attention to the siblings and the cousins. 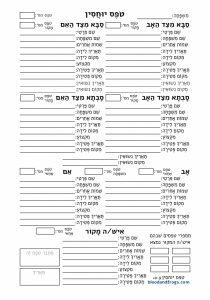 Loved the page on Hebrew fonts. Thanks so much for the great info.